When proper oral health care habits are established at an early age, they can help prevent the development of cavities and other serious dental problems. Babies are unable to take care of their own teeth and gums, making parents responsible for helping them clean. As children grow older, they may require additional encouragement to recognize the importance of healthy habits. Both parents and educators can make this process fun and enjoyable for kids. Activities that are educational and creative can spark interest in good habits. Play is a proven way to learn, and play-based learning is becoming an effective norm for young ones. This approach also helps nurture a child’s creativity and problem solving skills. Regularly flossing helps remove food deposits that are stuck between teeth and gums. When food deposits are left behind, they eventually become plaque (which can develop into cavities). After demonstrating, encourage children to give it a try! For this activity you will need a hard boiled egg and a cup of vinegar. The egg shall serve as the tooth and the shell shall be the enamel. Just like the egg shell, enamel helps protect the inner part of the tooth and prevents it from decay. Explain to children the purpose of the egg shell. Compare it to a tooth’s enamel and share how it protects the tooth’s nerve endings. Let a child place the egg in a cup of vinegar. Ask them what happens if an egg’s protective covering is damaged. After a few days, check the egg that was left sitting in a cup of vinegar. Notice how the shell is soft and partially destroyed. Help children make the association to a tooth and how not taking care of teeth can result in damage. For this activity, you can either cut out pictures from magazines, use plastic toys shaped like food, or take a child to the grocery store. Our daily diet plays an important role in healthy teeth and gums. Explain which foods are good for teeth and which can be harmful. If you are using pictures, ask children to tape different food photos to a piece of paper labeled “good food” and “bad food.” You can use the same technique for plastic toys by using two labelled baskets. Have children sort the toys. You can also use a timer to make it a race against the clock. Additionally, you can plan a field trip to the grocery store. At the grocery, ask which foods are good for teeth and which are “not so good.” For children who love sweets, explain it’s okay to enjoy treats once in a while, if they rinse with water and brush. Games about proper oral care can be both educational and entertaining. They also provide a bonding opportunity for parents and children. While good habits and a healthy diet promote oral health, regular dental check-ups are also vital to long-term health. 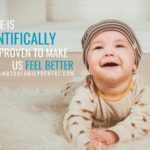 At Lambton Family Dental we provide children dentistry services in Sarnia, Ontario, and encourage children to take care of their gums and teeth at an early age. Schedule an appointment with us today at (519) 344-5747. We look forward to hearing from you.